Evelyn Glennie (b. 1965 in Scotland) graduated from the Royal Academy of Music in London at the age of 19, with the piano and percussion as her principal subjects of study. She gave the first ever percussion recital and percussion concerto in the history of the Royal Academy of Music. 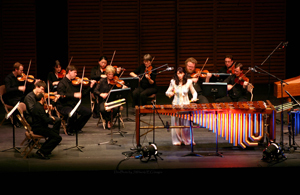 Ms. Glennie is one of the world's top international concert soloists and the most in demand solo percussionist. She has performed with virtually all of the world's finest orchestras and greatest conductors, and has commissioned over one hundred works for solo percussion from many of the world's most talented composers. Besides concert activities, Ms. Glennie regularly composes and records music for film and television. Evelyn Glennie has won two Grammy Awards and has received two further nominations for her previous recordings. In 1993 she was awarded the OBE (Officer of the British Empire) for her services to music.